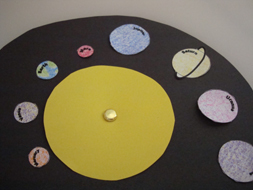 Here is a great craft to help teach your kids about space and all the orbiting planets. Plus, the craft is a lot of fun. I found this craft over at BusyBeeKidsCrafts and they have the right idea….. use a fun craft to help teach your children about space. Look how cute this robot is….. so cute!! And, it is made from many recycled materials which makes this robot even cooler. 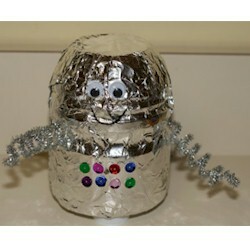 FreeKidsCrafts shows you how you can take tin foil, an empty container and soda bottle lids and make it into a robot like above. How fun!! I love this craft…. I just love how these little aliens turn out. I found this Outer Space craft over at Craft Jr. She shows you step-by-step how to make the aliens as pictured above. But, she also explains how if you have mismatched colors or pipe cleaners of different sizes it doesn’t matter…. they are aliens after all. What a pretty craft….. I love all the colors in this Spiral Galaxy Craft. And, believe it or not this Outer Space craft is made with a paper plate and some glow in the dark paint. TheCraftyClassroom shows you in detail how you too can make this craft. Here is a cool craft that will be a lot of fun to put together. 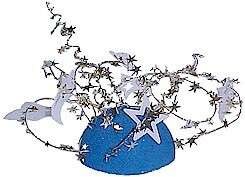 Plus, this Out of this World Centerpiece is perfect if you are having an Outer Space birthday party. Imagine this being the centerpiece at the Birthday table. Find out how to make this over at MakingFriends. This is an awesome Outer Space craft because your child is going to have to care for it everyday. 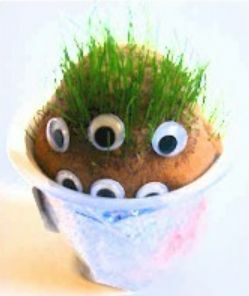 It is actually made with real grass seed so your child will have to care for it everyday for the grass to grow. 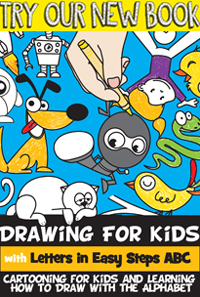 Check out FreeKidsCrafts for all the details. These are pretty creepy looking…. aren’t they? 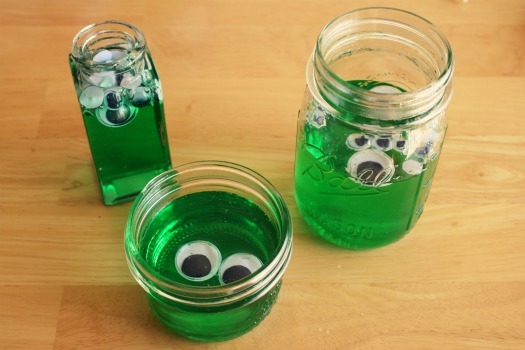 I found this craft over at MakeAndTakes and she had it posted as a Halloween craft, but I thought this craft would also fit for an Alien…. so I am including it in this Outer Space crafts list. Check out her site for all the “how-to” details. 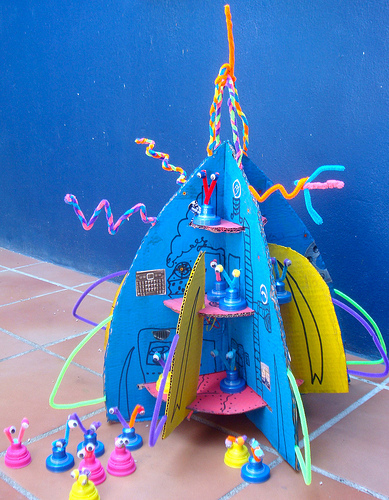 Isn’t this Rocket craft just adorable? I love it!! And, it is made out of a cardboard box. What a creative idea. You will need help from an adult for this craft as they do use a craft knife. But, it would be so much fun making this with your parents. Check out Se7en for the step-by-step details. I just had to add this cake to this post. I know it really isn’t a craft Per Se, but I think cooking can be quite crafty…. and it is also a ton of fun to do with an adult. 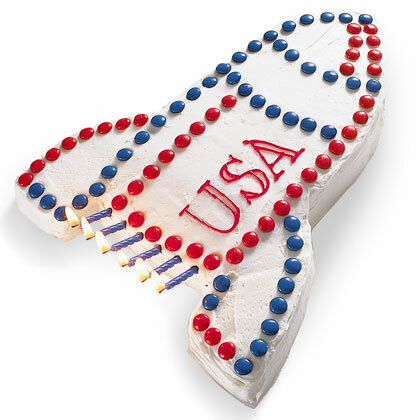 So, check out this Outer Space cake over at FamilyFun and get the recipe to cook with your parents. This would be great for an Outer Space birthday party. 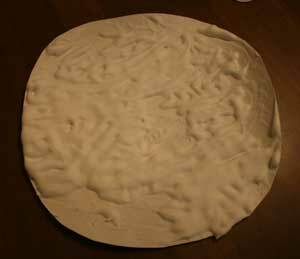 AllKidsNetwork shows us how if you mix shaving cream and glue together it makes a lumpy and bumpy surface….. just like the moon. Actually, what they explain is that while the glue dries it makes a smooth-textured material that puffs while it’s drying and then flattens out. Isn’t that cool? Go to AllKidsNetwork to check out the full details. Wow, isn’t this space shuttle amazing?! It’s just so creative. And, the best part…. It’s made out of mostly all recycled materials. How cool is that?! 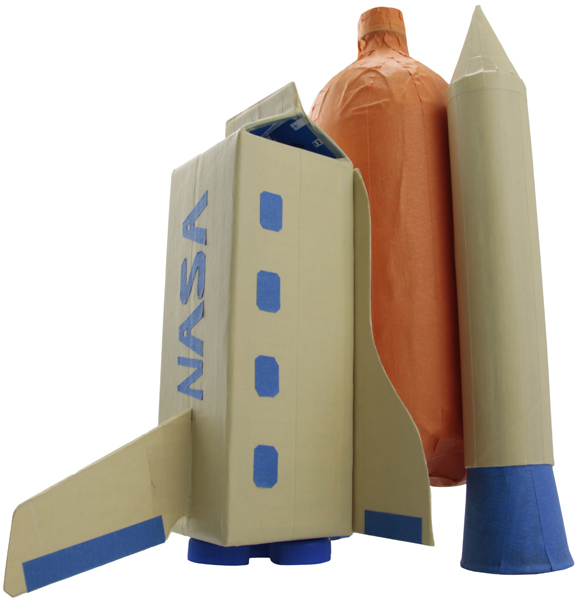 Kids of all ages will love making this space shuttle…. the younger kids will need help from an adult. Check out LooLeDo for the entire craft tutorial.